Languages Spoken in Argentina Spanish is by far the most spoken language in Argentina. Italian is the second and Levantine Arabic is the third. Argentina Currency Argentinian Pesos (ARS) – the peso has been very volatile over the past several years due to their economy. Make sure to check the exchange rate right before you go. Start Planning – 2019 Full Tour Schedule Announced! Ready to start planning your vacation for next year? Good news, we’ve finalized the Taste Vacations 2019 tour schedule! We are thrilled to again be offering a variety of food, wine, and beer vacations here in the U.S. and abroad. We’ve kept in our favorite experiences but have also updated a few details in each itinerary. We are committed to providing the best tours possible which is why we take our guest’s feedback very seriously and continuously address our itineraries accordingly. We believe our 3-day Sonoma Wine & Walking Tour is a perfect way to get a taste of what the area is all about. You get to “take a peek behind the curtain” by taking leisurely walks through private vineyards and connecting with people within the wineries that you may otherwise never see or meet. But if you are looking to extend your vacation a bit longer, we have a few recommendations on what to do in Sonoma County once you’ve tasted your fill of their incredible wines. Plan Your 2019 Vacation – Get Our Tour Catalog Mailed To Your Door! We know a lot of you are big pre-planners – who doesn’t love to daydream about where you want to travel to next? 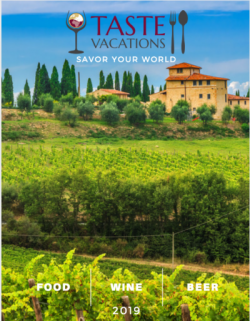 To help you get a jump start on planning your vacation for next year, we are releasing our 2019 Taste Vacations tour catalog in the coming weeks. Want to snag a copy? Complete the form below and we’ll send you one in the mail as soon as they are ready. Exploring the Food & Wine of Bordeaux – A New Tour! We are quite selective in the regions we choose to add to our food, wine and beer tour schedule. We like to focus on desirable culinary destinations where we can provide our travelers with remarkable experiences. With that in mind, we are very excited to announce our newest food and wine tour to iconic Bordeaux, France. There are so many reasons to explore this incredible city and region including the history, cuisine, and of course, wine of Bordeaux.